A picture of the man supposedly resurrected from the dead. "When we speak about miracles, we are talking about something that has gone beyond the rationalizations of what we accept as norms." Pastor Lukau regretted the whole ordeal in an interview with Power FM's Drive host, Thabiso Tema. "Before entering the premises of the church, the coffin began to shake, meaning the person was alive. 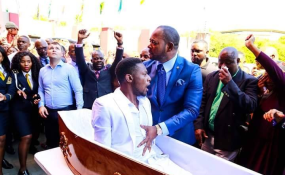 I am really sorry for the misrepresentation of facts, the man was not dead and has never been in the mortuary as we earlier said," Mr. Lukau explained. "We are the house of God and I'm just a pastor serving in the house of the Lord. But I am sorry that we didn't tell people the truth in the first place," he added.